I had a chance to run the new 150 for about 20 minutes this morning. It was mounted on a 19-foot Boston Whaler. The engine popped the boat out of the hole quickly and showed some impressive mid-range power. I will be filing a more extensive report in the next issue of Soundings Trade Only. Prior to Miller&apos;s presentation, Mercury announced the winners of an online video contest it held this year, prompted during the brainstorming for a video on the 150 FourStroke. 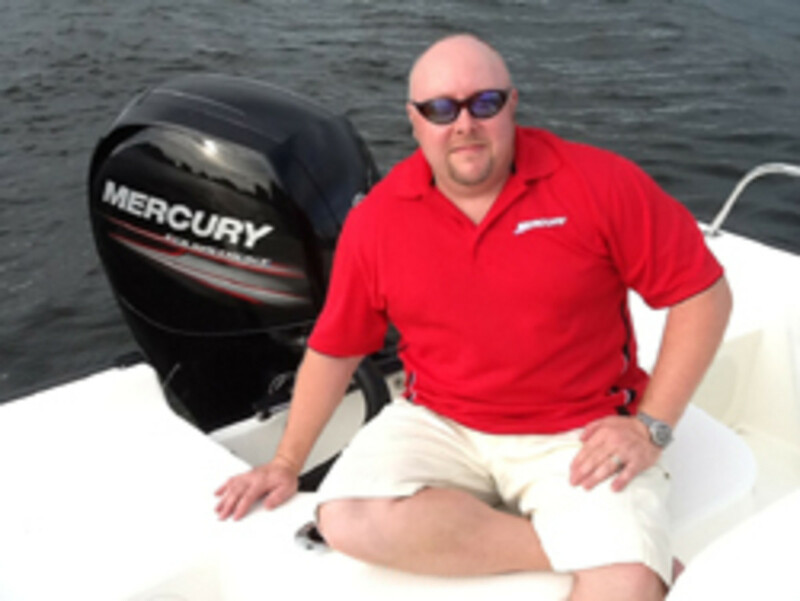 The engine manufacturer received more than 300 videos from Mercury outboard owners and their families in the United States, Canada and other spots around the world, said Mike Shedivy, Mercury’s vice president of marketing. One of the winning videos was submitted by a young family from Canada (Orleans, Ontario). It featured Kelsey and Kalan King, ages 9, and 7, respectively, performing a skit in which their labeling of a broken-down competitor engine came to life when they placed a cardboard Mercury placard on its powerhead. The boys and their parents, Lonnie King and Linda Germain, were in the audience for the presentation. "I really want to tell the story of the King family video," Webeje said before the movie was shown. "But I have to let the video speak for itself." For winning the contest, the family received a new Mercury outboard. They have yet to choose the model. Mercury Marine and Cummins Diesel formed a partnership in 2002 to supply integrated diesel propulsion systems to the market. Mercury Marine will now be responsible for the worldwide sales, distribution, service and support of the CMD range of high-speed diesel engine systems, including the TDI/SDI ranges of Volkswagen diesel engines, Kevin Grodzki, Mercury’s president of sales and marketing and commercial operations. Mercury and CMD are still partners, and CMD will continue to oversee the production and distribution of the higher-horsepower models, which includes engines for the Zeus pod-drive system. "The market has changed, and what we found was that the customer base for the high-speed diesel market lines up very well with gasoline sterndrive engines and outboard engines, so what we decided to do was take that piece of the [Mercury-CMD venture] — the high-speed diesels only — and shift that over to Mercury&apos;s responsibility," Grodzki told about 50 marine journalists during a press event Thursday at the Fort Lauderdale show. Mercury will take over this portion of the business after a transition period lasting through 2012, Grodzki said. The high-speed engines include the new lineup of TDI diesel engines from Volkswagen now being offered in a joint venture between CMD and Volkswagen. "Volkswagen is going to be an outstanding partner, with the technology they have and the performance of their engines," Grodzki said. "The scope and scale that they have as a manufacturer and a partner is going to change the industry. And with our distribution and service network, that technology will be brought to a much wider base."